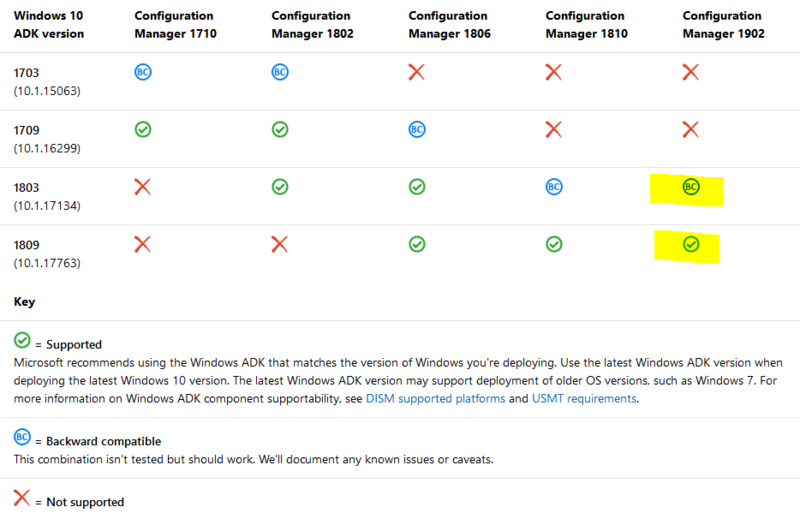 What version of the Windows ADK is supported with System Center Configuration Manager (Current Branch) version 1902 ? | just another windows noob ? System Center Configuration Manager (Current Branch) version 1902 was released recently (2019/3/27). You can read the official announcement here and for a detailed list of what’s new, please see the following blog post. I blogged about how you can upgrade to 1902 here and I’m in the process of showing you how you can install it from scratch here. With each new release, things evolve and change, and it can be a challenge knowing which version of SCCM supports which version of Windows ADK (Assessment and Deployment Kit). What is the Windows ADK ? What version of ADK is supported with Configuration Manager 1902 ? Never fear, there is a support matrix out there to help you with this. The following link has a table which details what versions of Windows ADK are supported by the different Current Branch releases of SCCM. So in a nutshell, at the time of writing (2019/4/12) ADK 1809 is the recommended choice for SCCM 1902 Current Branch. You can use the links below to help with that. What’s new in ADK tools for Windows 10, version 1809. More info about Windows ADK version 1809 is available here. This entry was posted in 1902, Assessment and Deployment Kit. Bookmark the permalink.